The annual Tsuboya Toki Matsuri (Tsuboya Pottery Festival) will take place this weekend, from Sep. 20 through 23 in Yogi Park in Naha City. The festival is held to celebrate traditions of Tsuboya pottery making and to thank costomers who patronize this traditional handicraft district in Naha City. The festival’s main event, the pottery competition, will take place on Sunday. The contest is called ‘Kami Subu,’ meaning, “pot making competition” in Okinawan dialect. The contestants are craftsmen and their younger apprentices separated into red and white teams. The teams compete how fast and how good quality pottery they can create on their wheels. Besides pots, the participants also make other kind of items including saucers, jars and other clay ware. Both sides will have their cheering parties pounding Taiko drums and bells. Every year, the competition is the biggest attraction at this festival, and like Eisa festivals around the island, gathers plenty of audience. Visitors can also try their own hand at the potter’s wheel during the festival. Everything that is exhibited is also on sale. Tsuboya flags are hoisted around the park during the festival. Many pottery enthusiasts from every part of Okinawa visit the festival year after year, and it’s also a big attraction for tourists. 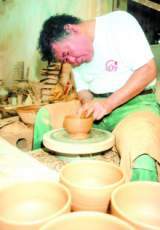 For more than 300 years Naha’s Tsuboya district has been the symbol for Okinawan pottery. It has produced countless famous craftsmen such as Jiro Kinjo (Living National Treasure), Joga Shima, Isao Arakaki and many others who have gained fame and reputation far outside Okinawa. They make pots, saucers, coffee cups, and shi-shi lions (Okinawan charm). In Tsuboya, pottery workshops line the stone walled street called “Yachimun Dori (Pottery Street)” where the best craftsmen work and live to this day. The district got its start three hundred years ago, when Okinawa’s three pottery districts of Takaraguchi, Wakugawa and Chibana were integrated into Tsuboya by a royal degree of the Ryukyu Kingdom. The need for pottery had increased greatly because of the busy trading with China and other countries, and a larger production base was needed to satisfy the demand. The name Tsuyoya was also given to the district in this historical event; Tsubo meaning pot, Ya meaning specialists. Two kinds of Tsuboya pottery was produced. One is called jouyachi (pottery with medicine, Yuyaku including) and arayachi (without medicine). Around the time of Haihanchiken (administrative reform that changed Japan’s provinces to prefectures), ceramic ware from the mainland Japan came in Okinawa and almost drove Tsuboya pottery out of business as the ceramic from the mainland was cheap and less fragile. During the Second Worl War, Tsuboya’s craftsmen were commissioned to make lots of saucers for Japanese military, battery cases and grenades, just like other pottery producing places in Japan. After the war, workers at Tsuboya’s pottery factories became the first to restore Naha City. The craftsmen were camped in Yaka, Ishikawa City but were soon sent to Naha help rebuild the city. They had a very positive attitude and were tough creating thousands of life’s necessities for people of Naha who were in need of everything. As the reconstruction proceeded and the city grew, Tsuboya area became urbanized and more crowded. Tsuboya kilns gradually became an annoyance for the people. The town’s change forced some craftsmen to move out of Naha to more spacious places where they could fire their kilns such as Yomitan village. Modernization thus became a threat to the traditional art of Naha, although lots of craftsmen are still hard at work in Tsuboya every day using electric kilns that do not produce smoke. Many pottery shops are still open and selling lots of Tsuboya ware to tourists and locals, although the number of people visiting the area is down due to the prolonged economic slump in Japan. The area accommodates traditional and modern style pottery workshops in a traditional atmosphere. It still stays a favorite place for tourists to visit, since it is the only place where so many pottery shops are gathered together. To get to the festival, take Route 330 to Naha. Yogi Park is on the left just before Naha Police Headquarters. Parking in the area is very limited, and it is better to park in one pf the pay parking lots in Naha and take a taxi. Tsuboya districts is located on the right side of Route 330 before Yogi Park. For more info on the festival and Tsuboya, contact Tsuboya Pottery Cooperative Association at 098-866-3284. This studio uses a lot of red ink in their pottery. An old master put much effort in finding the right combination of colors he was searching for to invent this tint. This pottery studio is over 300 years old and was established in a Ryukyuan town. This guild's original artwork is called Kuina that is translated as Bird in Okinawan dialect. This kind of pottery has a simple white background with a red bird design. Kokuba Pottery also offers pottery classes everyday from 4 to 6 p.m., and they have two English-speaking instructors to guide you. You must reserve your spot to enroll in a two-hour course, but you can do so by calling 098-869-0006. Prices for this class are ¥3,000 for adults and children ages 12 or older and ¥2,500 for kids younger than 12. You will be able to pick up your original pottery two to three weeks later. Kiomasa's original design uses a red background with a fish decoration. Their main idea is to make pottery where you feel their warm heart. 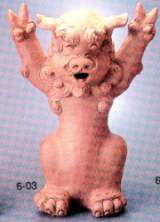 Ikutoen sells all types of Shisa lions, from plain to highly decorative. They also teach pottery lessons anytime from 9 a.m. to 6 p.m., Monday through Saturday, and you can register by calling 098-866-1635. Classes are two hours long and cost ¥2500. 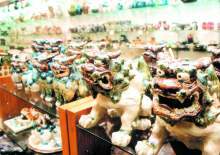 The pottery instructors will teach you how to make the male Shisa lion, plates, and cups. After the class, you can pick up your original pottery two to three weeks later, or you can have it mailed to you for a small fee. Yachimun-ya means pottery in Okinawan dialect. This studio sells all kinds of shisa and shisa decorations as well as awamori cups and pots. To preserve the taste, many keep their fine awamori in clay pots. This studio sells all kinds and sizes of shisa, even up to three feet tall! Arakaki pottery uses a white background with a fish or flower design to give a traditional Okinawan feel. Takaesu makes a lot of flasks and cups for awamori as well as shisa and shisa decorations. They mainly use fish and leaves as decorations on their pottery. Hamako pottery has a plain white background with a simple decoration. Fuenu Gama has a history going back for 320 years when the kiln was originally established. The original kiln was a large wood-burning Noborigama kiln, also known as climbing kiln. The coffee shop and store are open 9 a.m. to 8 p.m. Major credit cards are accepted. Gallery Gunsho has a permanent exhibition and sale of works by pottery artist Masakatsu Soma. It also has a coffee shop. This area is one of the very few that was spared from complete destruction during the war. It still has original stone pavement that was constructed about 300 years ago.